Cookies In A Jar – Chocolate Cookie Christmas Gift! Always wanted to make cookies in a jar but don’t know where to start? Besides being delicious, these chocolate, chocolate chip cookies in a jar make great Christmas gifts, too! You’ll need to provide the cookie ingredients and the jars. However, I’ve included printable gift tags with baking instructions so you can gift these and the recipient will know exactly how make the cookies! These cookies are definitely for chocolate lovers. The recipe calls for you to add chocolate chips and white chocolate chips to the jar. However, I think it would be just as delicious if you added candies, like Mini M&M’s or even peanut butter chips to the cookies. This is where your creativity can shine! 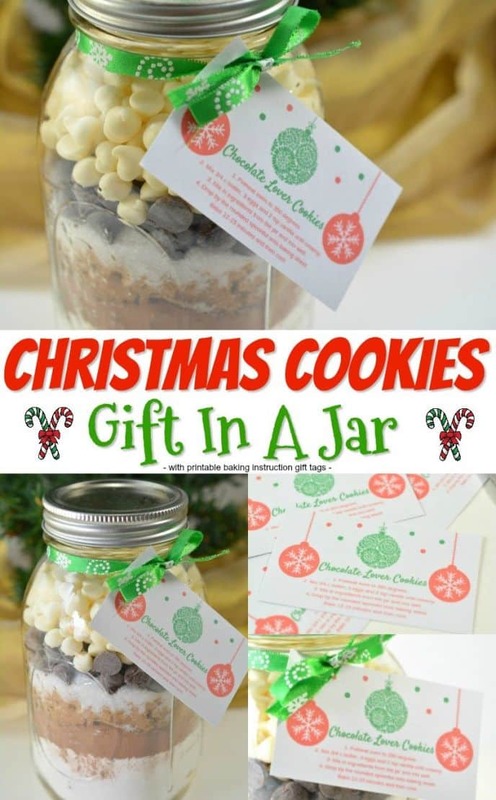 What do you say, let’s make these cookies in a jar gifts for everyone this year! You’ll need a bunch of mason jars but it’s such an easy gift, and relatively inexpensive, too! The mason jars are a few bucks a piece and the ingredients comes out to a buck or two each. So really you can’t get a much more affordable gift than this! Funnel – optional but keeps things nice and clean. Use a pastry bag, folding it around the outside of the mason jar, or tape a piece of card stock into a funnel shape to help! This list is on these printable tags! With a funnel in the quart sized jar, add in the flour., baking soda, baking powder and salt into the jar. Layer in the unsweetened cocoa, brown sugar, and then granulated sugar. Pile in the chocolate chips and white baking chips on top. Put the lid on the jar securely. Cut out the holiday printable gift tag. Punch a hole in the upper corner of the tag. Don’t you just love easy Christmas gifts? Cookies in a jar gift. This chocolate, chocolate chip cookies in a jar are perfect for holiday gifts. This list is on the printable tags!